See the route map for directions on how to find the Garden. Picnics are allowed in the Garden. Braais are allowed in the Garden, but only in the designated area. Tables are not permitted unless by prior arrangement. Music is not allowed except at officially sanctioned concerts and parties. Bicycles (or other pedalled mode of transport) is not allowed in the garden. A copy of the veterinary certificate with rabies clearance and owner’s contact details to be provided for office use. Dog/s must have received rabies inoculation and produce a vet’s certificate. Failure to obey any of the regulations will result in the withdrawal of the privilege of walking the dog/s in the Garden for a period of 6 months, without exception. Wheelchairs are provided at R5.00 per visit. Farmers market every Saturday from 06h00 – 10h00am. Tours are offered if prior arrangement is made. Events like wedding, tea parties, baby showers etc. are permitted in the Garden. 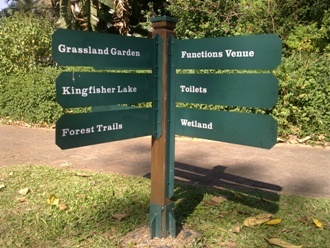 Directional signs are installed at every junction in the Garden to give directions to visitors.